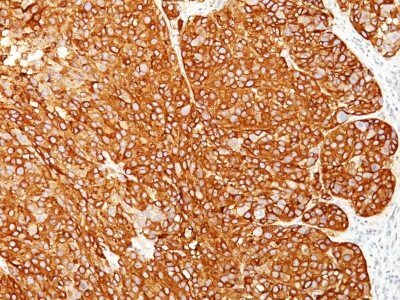 This antibody cocktail recognizes three melanoma-specific proteins, which include MART-1, Tyrosinase and gp100. MART-1 is a newly identified melanocyte differentiation antigen recognized by autologous cytotoxic T lymphocytes. Tyrosinase is one of the targets for cytotoxic T-cell recognition in melanoma patients. Function of gp100 is not known but it is reported to be a useful marker for melanocytes and melanomas. This cocktail of three markers is designed for extremely sensitive labeling of formalin-fixed, paraffin-embedded melanomas and other tumors showing melanocytic differentiation. Catalog number key for antibody number 0701, Anti-Melanoma Marker (HMB45 M2-7C10 M2-9E3 T311) The prefix indicates conjugation, followed by the antibody number and size suffix.